The pop-culture prominence of Tolkien’s Middle-Earth and, much more recently, the magical world of J.K. Rowling’s Harry Potter, stand on the shoulders of two classic fantasy realms: Lewis Carroll’s Wonderland and Frank L. Baum’s Oz. Of the two, Wonderland received much fanfare and reinvigoration in the form of a recent blockbuster movie. 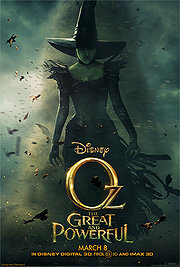 Oz had to be content with the musical Wicked, until Disney stepped in.